During the holidays, I try to find ways to give back and make it less about consumerism and more about spreading positive energy. 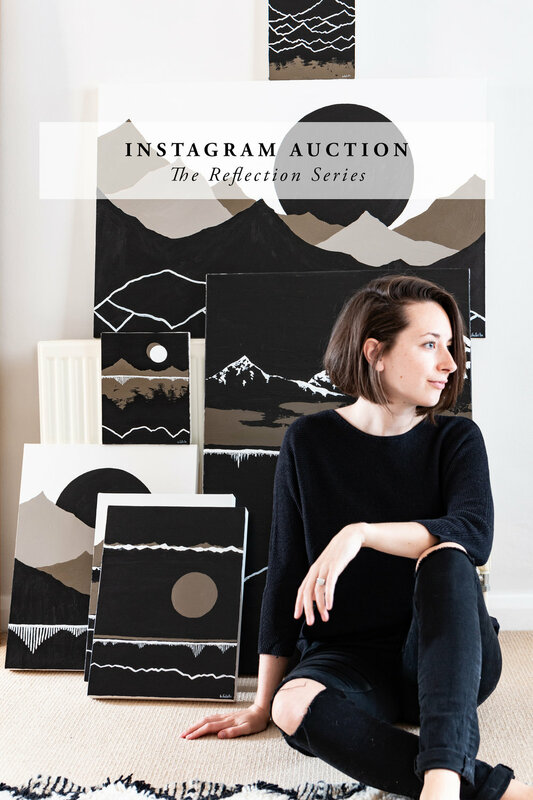 Last week I polled my Instagram following to see if there was any interest in an auction of my Reflection series where a percentage of the proceeds would go to charity. Having done other auctions like this in the past, I thought it would be an excellent way for you all to get some art for yourself or loved ones while also having the money go to a well deserved cause. 100% of those responses were a yes so here we are ready to launch into action Tuesday! The 'Reflection' series paintings are inspired by reflections of mountains in natural bodies of water. While evoking how we feel amongst such grand settings, they conclude that nature is grounding; it is humbling. Each work visually represents the process of clarity that comes from the moments we are able to escape to nature and process life around us. For more info on the series, read my blog post The Reflection Series, Abstract Landscape Paintings. We have a total seven paintings from the series that we will be auctioning off. All were painted by me (Britt Fabello) using acrylic paint on natural canvas. Each painting is unique and there are details for each below matched up with a picture of the painting so you can know exactly what you are bidding on. We will be kicking off this auction on Tuesday, 4 December 2018 ar 12:00pm GMT. All paintings will be opened for bidding at this time. Bidding will continue on every painting for 24 hours, ending on Wednesday, 5 December 2018 at 12:00pm GMT. With only a day of bidding, be quick to stay on the painting your heart is after! To connect these paintings back to their meaning, I will be donating 10% of the proceeds to Global Greengrants Fund (GGF). GGF is an organization I worked closely with during my days as a graphic designer and I deeply appreciate the work that they do around the globe. In their own words—“We catalyze grassroots-level solutions by putting resources directly in the hands of the best stewards of our environment— local people.” GGF works to find solutions for climate justice, to create healthy ecosystems and communities, enhance local livelihoods, support the rights of indigenous people, and leads the way in women’s environmental action. Follow @brittfabello or #reflectionseriesauction on Instagram. FIRST BIDDER: "brittfabello £25 britt@brittfabello.com"
FOLLOWING BIDDERS: "secondbid @brittfabello £30 secondbid@secondbid.com"
Once the bidding is closed, we will announce all the winners by the end of the day on Wednesday, 5 December. By Thursday, 6 December 2018, we will be in touch through the provided email with details. Shipping will be free and all final invoices must be paid via PayPal (please note that you do not need a PayPal account, just a valid email address and credit card). Please join me on Tuesday, 4 December 2018 at 12:00pm GMT, for the Reflection Painting Series Auction. I am excited to get this rolling and have you all there! To join and watch the fun, be sure to follow @brittfabello on Instagram.